Did you have a good weekend? Did you spoil your mamas with gifts ?? I met my mother yesterday, and while we were in the car I gave her my present... Guess what her reply was!!! What is this Eleni?? is it for Mrs. I.??? (she had asked me to make her another gift for one of her friends)..uuuggghhh.... and I'm like what are you talking about mom!!!!??? ?, didn't I tell you yesterday over the phone that I finished YOUR gift??!!!!! And she's like, ooohhhh yes now I remember...!!!! I explained to her all about the Dresden plate design, the inspiration behind this pattern, everything!!! And she LOVED it!!! You were all so right !!!! 1. Zig zag quilt tutorial from Little Birdie Secrets. Aren't the colors gorgeous on this quilt?? 2. Bonnie from Pink Stitches made the previous week a cute little basket based on this tutorial from Ayumi. I instantly thought, what a great project!! I mean who doesn't need baskets around the house. So I decided I should give it a try!!! 4. I just love this pretty little pouch from Bijou Lovely. THE color and pattern combination... I wish there was a tutorial, but I'm sure I'll find something. 6. The scrappy appliqued pillow from Susan Weinroth. Isn't it gorgeous??? 7. I've had this quilt in my bookmarks for a looooong time now. The Baby Life Quilt from V & Co. Isn't it sssooo cute in it's simplicity.!!!. A friend is expecting in June, hopefully I'll be able to have it ready by then... I hear weekly project again or am I just hearing voices??? 8. I'm determined to have the Single Girl Quilt on my bed next fall!!! I think that this particular pattern was the first quilt I ever saw (at least online) and said to myself I have to try to MAKE this!!! 9. I wanted to make a baby stroller quilt for Love (my newborn niece), and I was searching for a tutorial. And here it is from joybucket. Apart from being so cute, I think that it's also practical!! Well, I could go on and on uploading mosaics with favorite projects, but I do have to continue with my custom orders:) Have to go cut my fabric!!! Great stuff! 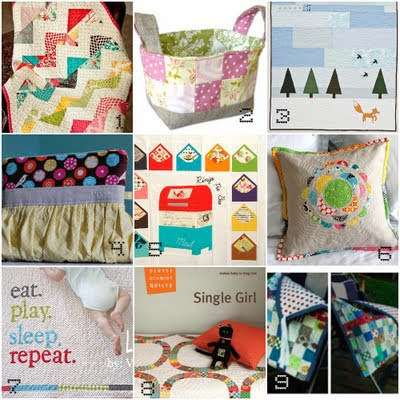 I love the zig zag quilt! We just finished one for my mom for mothers day! Your fantastic thanks for sharing your inspiration! I love some good inspiration! Giving you an award! One that was passed on to me so I wanted to share the love. Hopefully posting it in the next day or two! Ooh thanks for posting this! I was trying to remember where I saw that zig zag quilt! Its beautiful! My quilt list is growing and growing! !